Over the 300 years of the Viking Age, and with the expansion of the Norse landnám (new land settlements), the economic structure of the communities changed. In 800 AD, a well-off farmstead in Norway would have been primarily pastoral, based on the raising of cattle, pigs, and goats. The combination worked well in the homelands, and for a time in southern Iceland and the Faroe Islands. 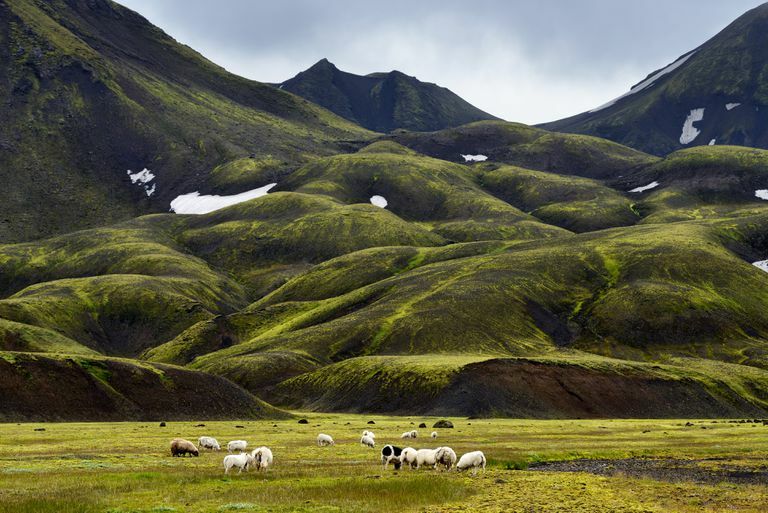 In Greenland, pigs and then cattle were soon outnumbered by goats as conditions changed and the weather became harsher. Local birds, fish, and mammals became supplemental to the Viking subsistence, but also to the production of trade goods, on which the Greenlanders survived. By the 12th-13th centuries AD, cod fishing, falconry, sea mammal oil, soapstone and walrus ivory had become intense commercial efforts, driven by the need to pay taxes to kings and tithes to the church and traded throughout northern Europe. A centralized government in the Scandinavian countries increased the development of trading places and towns, and these commodities became a currency which could be converted into cash for armies, art, and architecture. Greenland's Norse in particular traded heavily on its walrus ivory resources, in the northern hunting grounds until the bottom fell out of the market, which may have led to the demise of the colony. Barrett, James, et al. 2008 Detecting the medieval cod trade: a new method and first results. Journal of Archaeological Science 35(4):850-861. Commisso, R. G. and D. E. Nelson 2008 Correlation between modern plant d15N values and activity areas of Medieval Norse farms. Journal of Archaeological Science 35(2):492-504. Goodacre, S., et al. 2005 Genetic evidence for a family-based Scandinavian settlement of Shetland and Orkney during the Viking periods. Heredity 95:129–135. Kosiba, Steven B., Robert H. Tykot, and Dan Carlsson 2007 Stable isotopes as indicators of change in the food procurement and food preference of Viking Age and Early Christian populations on Gotland (Sweden). Journal of Anthropological Archaeology 26:394–411. Linderholm, Anna, Charlotte Hedenstiema Jonson, Olle Svensk, and Kerstin Lidén 2008 Diet and status in Birka: stable isotopes and grave goods compared. Antiquity 82:446-461. McGovern, Thomas H., Sophia Perdikaris, Arni Einarsson, and Jane Sidell 2006 Coastal connections, local fishing, and sustainable egg harvesting: patterns of Viking Age inland wild resource use in Myvatn district, Northern Iceland. Environmental Archaeology 11(2):187-205. Milner, Nicky, James Barrett, and Jon Welsh 2007 Marine resource intensification in Viking Age Europe: the molluscan evidence from Quoygrew, Orkney. Journal of Archaeological Science 34:1461-1472. Perdikaris, Sophia and Thomas H. McGovern 2006 Cod Fish, Walrus, and Chieftains: Economic intensification in the Norse North Atlantic. Pp. 193-216 in Seeking a Richer Harvest: The Archaeology of Subsistence Intensification, Innovation, and Change, Tina L. Thurston and Christopher T. Fisher, editors. Studies in Human Ecology and Adaptation, volume 3. Springer US: New York. Thurborg, Marit 1988 Regional Economic Structures: An Analysis of the Viking Age Silver Hoards from Oland, Sweden. World Archaeology 20(2):302-324.